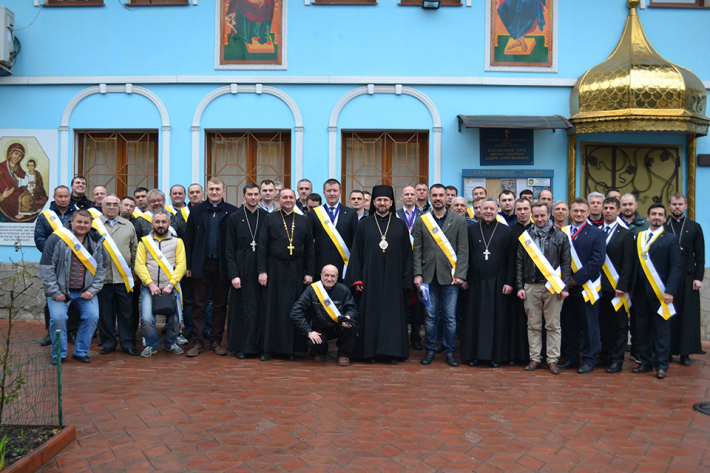 With the blessing of a valid bishop, knight Mykhailo Bubniy, Exarch of Odesa and promotion of Bohdan Kovaliv, a territorial delegate of Ukraine the first initiation of men Catholics to Knights of Columbus organization was held in Odesa at the Cathedral of Saint Andrew the First-Called, on Saturday, March 16, 2019. With the beginning of an event all participants prayed Moleben to Christ, Lover of Mankind led by bishop Mykhailo. In his word to the candidates, bishop said: “Your boldness and bravery to initiate yourselves to knighthood testifies that you are ready not only to constantly participate in Services, but you are also eager to be a part of life of our parishes, be sensitive about the needs of other people, be engaged in charity and create a true brotherhood of devoted and practicing Catholics”. After the prayer the initiation ceremony has begun. It was led by a group of knights from territorial and regional places of Kyiv and Vyshgorod cities consisting of five brothers-knights: Roman Panivnyk, Levko Dovhan, Mykola Dmytrovskiy, Stepan Dzus and Mykola Mostoviak. Within this first initiation 40 brothers, among them five priests and one deacon were enrolled in the program: Fr. Mykola Slobodian, PhD, court vicar and economist of Odesa exarchate, Fr. Ruslan Ostafiy, an administrator of the Cathedral of Saint Andrew the First-Called in Odesa, Fr. Ihor Taras, Lic., church assistant at the cathedral in Odesa, Fr. Petro Makovetskyi, Lic., Vice-chancellor od Odesa exarchate and church assistant at the parish of Holy Apostles Peter and Paul in Yuzhne city, Fr. Vitalyi Burchyn, notary of Odesa exarchate and church assistant at the parish of Church of the Ascension of the Lord in Odesa and deacon Nazariy Labay. Since the number of brothers was quite big, the participants reached a decision to create in Odesa a new Council of St. Andrew The First-Called. The leading role of it went to Br. Dmytro Artemenko, a great knight and his deputy Br. Ihor Peniazev with Fr. Ruslan Ostafiy as its chaplain. After the memorable event was finished the participants made a photo and had an opportunity to share a dinner, personally talk to brothers-knights from Kyiv and Vyshgorod and listen to their valuable advice.